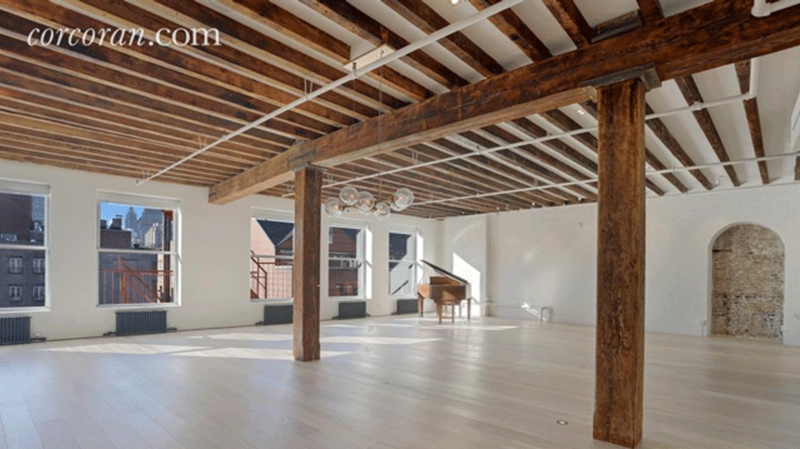 If you’re looking to rent a loft in New York City with a little personality, consider this newly-available space in downtown Manhattan. The apartment once belonged to the late artist Duane Hanson (known for his honest, hyperreal sculptures of average Americans), and an original tag from Jean-Michel Basquiat still plasters a hallway on the building’s fourth floor. The floor above it is now on the market for anyone to rent—as long as they can afford the $29,000 monthly price tag. The small patch of graffiti, which contains the artist’s signature “SAMO©” tag, has remained untouched by renovations throughout the years. Other features of the three-bed, four-bath listing include a personal library, beamed ceilings, and a chef’s kitchen. And if you still weren’t convinced of the apartment’s artistic character, it has also been used by photographers Terry Richardson and Ellen von Unwerth as a space for high-profile photo shoots. Noteworthy subjects who’ve been photographed there include Adriana Lima, Paris Hilton, and Marilyn Manson. You can check out the full listing on the realtor’s website.